The field proven Umbilical Running Frame system (URF) allows for independently running and retrieval of the X-mas Tree umbilical with flying leads during drilling operations from a Jack-up rig. This will prevent having to secure the well and pulling the HP riser system if any operational issues should occur on the X-mas Tree umbilical system. The URF is a compact and light weight design which is easily adapted to any subsea system suppliers’ umbilical configuration. During deployment the electrical and hydraulic flying lead connectors are parked onto the URF and the flying leads bundled and secured accordingly. 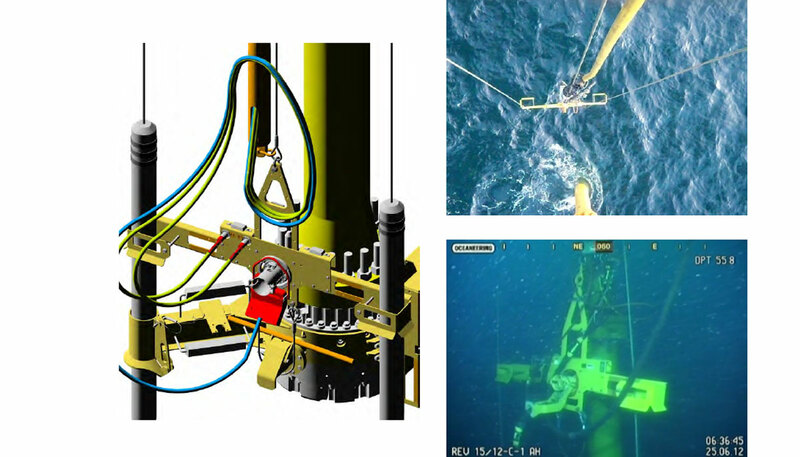 The URF is run on a tugger wire, locked to the subsea system (optional solutions) and flying leads mounted onto the subsea X-mas tree using ROV. This can be done in parallel with other rig drilling operations.